Officials wonder if maybe the environment could find some time in its busy schedule to refreeze a few glaciers. 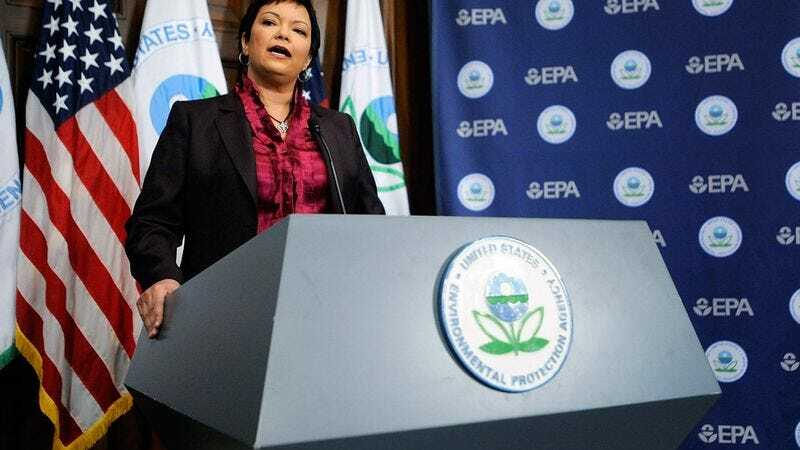 WASHINGTON—The U.S. Environmental Protection Agency called a press conference Monday to publicly denounce the environment for blatantly refusing to pull its weight in mankind's ongoing efforts at ecological conservation. "For 40 years, we have worked tirelessly to ensure the health and safety of our natural environment," a visibly angered EPA administrator Lisa Jackson told reporters. "But this can only work when it's a give-and-take. If the environment won't even meet us halfway by regenerating a rain forest or two, or pumping out some clean air and water every once in a while, then what's the point of us trying?" Added Jackson, "I'm as committed to saving the earth as anyone, but for crying out loud, when is the earth going to hold up its end of the bargain?" According to an EPA report, most of the environment's day-to-day processes can be categorized as rude and inconsiderate, in particular its selfish overreliance on "absolutely, perfectly clean soil" for sustainable growth, and its continual inability to act in good faith and adapt to rising carbon dioxide levels. Nature's "big thank-you" for mankind attempting to reduce CO2 emissions through cap-and-trade programs. The EPA also accused the environment of creating more work for the overburdened agency by stubbornly refusing to break down and absorb plastic and other synthetic materials, and producing rare species that can only survive in very specific, excessively fragile ecosystems. "We're putting in a lot of effort here with recycling and hybrid cars, so a little reciprocity from the environment would be appreciated," Jackson said. "God forbid the oceans replenish their own fish. And would it really be so much trouble for the earth's collective biospheres to pitch in and come up with a clean fuel alternative for use in our homes and vehicles? It's the environment's glaciers we're busting our asses trying to save, after all." Continued Jackson, "The environment needs to realize that mankind may not always be around to clean up its messes." Based on recent projections pointing to a high rate of extreme weather and accelerated climate change, EPA scientists have concluded that the least the environment could do is cut back on natural disasters, and perhaps try to grow some crops to help save the 1 billion people who go starving every day. A nice new waterfall here and there reportedly wouldn't hurt either, officials said. "I think everybody is getting a little fed-up with the hurricanes, earthquakes, and tsunamis," EPA engineer Thomas Bergman said. "Not to mention UV rays and acid rain. And, not to be petty, but shark attacks? Mankind doesn't have enough on its plate already without having to worry about getting eaten alive by killer sharks? I'm sorry, but that is just unacceptable." Added Bergman, "The environment may be in peril, but it has no right to treat us like animals." In an impassioned final warning, Administrator Jackson announced that if the environment did not start helping to stave off global catastrophe soon, it could face "serious repercussions" from humanity in the coming years, including massive Styrofoam-cup usage, oil spills, and exponentially higher emission rates. "It becomes very frustrating when you give, and you give, and you give, and you get nothing in return," said Jackson, holding back tears. "And after you've exhausted yourself from all that giving, you leave work and have two measly hours of sunlight before it gets dark or starts pouring down rain on you out of nowhere. It's like the environment doesn't even care. And what's with the leaves everywhere? Every fall, with the goddamn leaves! What are we, your servants? We're supposed to pick up after you? Jesus, if I find one more leaf or fallen branch clogging up my gutters, I swear to God, I'm going to snap." "Stupid environment," Jackson added. "Sometimes I wish it would just go away."